Good question! This year we are focusing the event by having a task in mind for everyone. 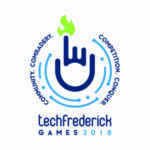 You see, later this year (October 5th), techfrederick is hosting it’s annual “Tech Frederick Games“, a day of fun pitting various technology companies of the region against each other in outdoor challenges. They would like to have a better scoreboard system that can display on a large screen during the event and be accessed via cell phones by the competitors to see where they stand. So where do you come in? We invite you to a competition! You can self-organize into teams (we’ll help people find teams at the beginning of the event if you didn’t come with your own). Each team will create their own solution to the problem (see below for more details). At the end of the day, each team will show off what they created. In the end, techfrederick will choose which solution they like the best, and will use it at this fall’s games! Are you just starting off as a programmer? Are you more into design? Do you not know anything but still want to join us. We have you covered! We will work with everyone to ensure that people get paired up with groups that will provide the best learning experience. We will also have a couple tables with dedicated people who are ready and willing to join you and use this ‘competition’ as a great opportunity to teach you the skills of the trade. Keep track of separate scores for each event per team, allowing a team display of how they did at each event, and/or possibly seeing rankings for each event. Add fun visual options for the large display. Whatever else you can come up with!